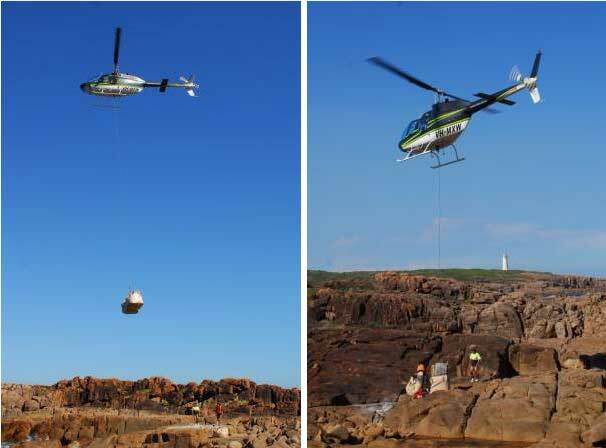 Cargo lifting in Newcastle areas that are hard to access including mountainous land, areas that are situated in coastlines or those that do not have an available road access has found the use of helicopter services Newcastle as a means of transport very valuable. Aerial helicopter cargo lifting is more adaptive to the effects of nature and is proven to be a safer alternative as compared to other means of cargo lifting. There are many considerations that should be made in calculating the cost of cargo lifting. Small-scale cargo lifting tends to be more cost effective than the usual transportation by ferry towards the target location. At AERO LOGISTICS we offer you cargo lifting both big or small on smooth or rough terrain. Safety for our pilots and your cargo will always be our top priority. Our tried and tested aircraft such as the Bell 205 Huey helicopter are meticulously maintained by the leader in aircraft organisation Hawker Pacific to ensure high standards of safety are kept at all times. Our aircraft can expertly lift and maneuver your cargo quickly and efficiently with the help of high-quality equipment. Our expert pilots have a keen eye for directing cargo into locations that have little room for error.